After years of on and off discussions, it's finally happening: T-Mobile and Sprint are merging. The two companies have released official statements, confirming the merger will finally happen and how it will work. The merger will be an all-stock transaction, with Sprint valued at $59 billion and T-Mobile at $146 billion. The combined company will be called T-Mobile, and will have "lower costs, greater economies of scale, and the resources to provide U.S. consumers and businesses with lower prices, better quality, unmatched value, and greater competition." It will be headquartered in Bellevue, Washington (where T-Mobile is currently based), with a second HQ in Overland Park, Kansas (Sprint's headquarters). From a competition standpoint, the merger is a double-edged sword; Sprint exiting the market would leave fewer options for carriers, but the combined entity could give Verizon and AT&T a run for their money. The announcement also heavily focused on 5G deployment, with T-Mobile and Sprint launching the AllFor5G.com site to explain why the merger would speed up the 5G rollout. T-Mobile's current CEO, John Legere, will serve as CEO of the new company. Sprint customers will be transitioned to T-Mobile's LTE network over the next three years (Sprint uses CDMA). In addition, subscribers on Sprint will be able to roam on T-Mobile's network for the next four years. The merger presumably still has to go through FCC/FTC approval, so it's not a done deal quite yet. 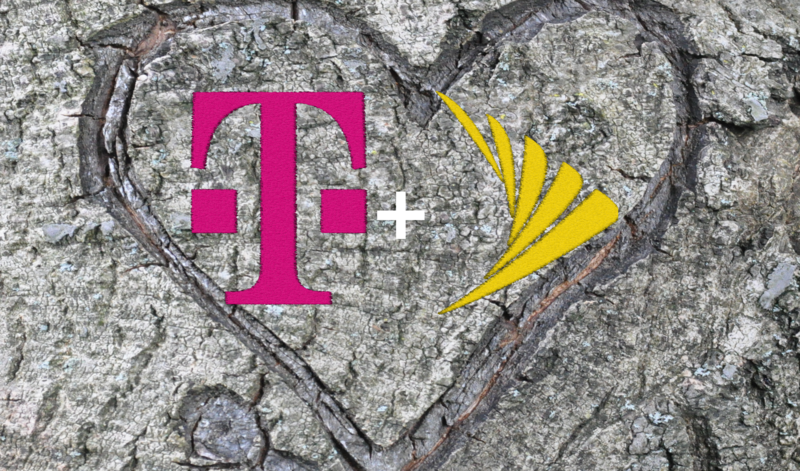 Bellevue, Washington and Overland Park, Kansas – April 29, 2018 – T-Mobile US (NASDAQ: TMUS) and Sprint Corporation (NYSE: S) today announced they have entered into a definitive agreement to merge in an all-stock transaction at a fixed exchange ratio of 0.10256 T-Mobile shares for each Sprint share or the equivalent of 9.75 Sprint shares for each T-Mobile US share. Based on closing share prices on April 27, this represents a total implied enterprise value of approximately $59 billion for Sprint and approximately $146 billion for the combined company. The new company will have a strong closing balance sheet and a fully funded business plan with a strong foundation of secured investment grade debt at close. The New T-Mobile will have the network capacity to rapidly create a nationwide 5G network with the breadth and depth needed to enable U.S. firms and entrepreneurs to continue to lead the world in the coming 5G era, as U.S. companies did in 4G. The new company will be able to light up a broad and deep 5G network faster than either company could separately. T-Mobile deployed nationwide LTE twice as fast as Verizon and three times faster than AT&T, and the combined company is positioned to do the same in 5G with deep spectrum assets and network capacity. The combined company will have lower costs, greater economies of scale, and the resources to provide U.S. consumers and businesses with lower prices, better quality, unmatched value, and greater competition. The New T-Mobile will employ more people than both companies separately and create thousands of new American jobs. Following closing, the new company will be headquartered in Bellevue, Wash., with a second headquarters in Overland Park, Kan. John Legere, current President and Chief Executive Officer of T-Mobile US and the creator of T-Mobile’s successful Un-carrier strategy, will serve as Chief Executive Officer, and Mike Sievert, current Chief Operating Officer of T-Mobile, will serve as President and Chief Operating Officer of the combined company. The remaining members of the new management team will be selected from both companies during the closing period. Tim Höttges, current T-Mobile US Chairman of the Board, will serve as Chairman of the Board for the new company. Masayoshi Son, current SoftBank Group Chairman and CEO, and Marcelo Claure, current Chief Executive Officer of Sprint, will serve on the board of the new company. It is critically important that America and American companies lead in the 5G era. Early U.S. leadership in 4G fueled a wave of American innovation and entrepreneurship that gave rise to today’s global mobile Internet leaders, creating billions in economic value and job growth. America’s early 4G leadership is credited with creating 1.5 million jobs and adding billions to the U.S. GDP. With 5G, the stakes are even higher – because 5G will be even more transformational. Only the combined company will have the network capacity required to quickly create a broad and deep 5G nationwide network in the critical first years of the 5G innovation cycle – the years that will determine if American firms lead or follow in the 5G digital economy. With Sprint’s expansive 2.5 GHz spectrum, T-Mobile’s nationwide 600 MHz spectrum, and other combined assets, the New T-Mobile plans to create the highest capacity mobile network in U.S. history. Compared to T-Mobile’s network today, the combined company’s network is expected to deliver 15x faster speeds on average nationwide by 2024, with many customers experiencing up to 100x faster speeds than early 4G. Neither company standing alone can create a nationwide 5G network with the breadth and depth required to fuel the next wave of mobile Internet innovation in the U.S. and answer competitive challenges from abroad. Neither can AT&T and Verizon in the near term, even though they will still respectively own 34% and 172% more spectrum than the combined company. Even with their vast resources, AT&T and Verizon cannot rapidly build nationwide 5G and their planned 5G networks will only be available sporadically in just a handful of very limited areas. To build nationwide 5G, they either have to kick current customers off LTE, which would take years, or use a type of spectrum (millimeter wave) that can only carry a signal 2,000 feet from a cell site – versus multiple miles for other spectrum – making it nearly impossible for either of them to create a truly nationwide 5G network quickly. Ubiquitous high-speed 5G service and Internet of Things (“IoT”) capabilities will ignite innovation across industries and create the conditions for U.S. firms and innovators to lead the globe in the 5G era. 5G for All will unleash incredible benefits and capabilities for consumers and businesses. Imagine, for example, augmented reality heads-up displays that see everything you do, and provide real-time cloud-driven information about the people and objects around you. Imagine never losing anything again because low-cost sensors with decade long battery life are embedded in everything you own. Imagine an earpiece providing real-time translation as a friend speaks to you in another language. Imagine environmental sensors in infrastructure and for agriculture having a profound impact on productivity. The new company expects prices to drop as competition heats up. The New T-Mobile will have lower costs, greater economies of scale, and unprecedented network capacity – a winning combination that should make wireless, and adjacent industries like cable and broadband, more affordable for everyone. The combination will dramatically accelerate T-Mobile’s successful Un-carrier strategy, which is built around listening to customers and solving their pain points. It will also leverage Sprint’s incredible spectrum assets and strong DNA. The deal will create more competition and unmatched value for customers across the country. And, existing T-Mobile and Sprint customers will benefit from increased speeds, coverage, and performance as the two companies’ networks combine. Wireless, broadband, and video markets are rapidly converging. AT&T is now the largest TV provider in the country. Comcast added more wireless phone customers last year than AT&T and Verizon combined, and Charter is launching wireless this year. And, more than 1 in 10 Americans (12%) use wireless as their only Internet or broadband connection, freeing themselves from the grip of the traditional, uncompetitive in-home broadband providers. Rural communities. Rural Americans seldom have a choice of more than one or two wireless, broadband, or cable providers. The New T-Mobile will end that with increased reach and plans to open hundreds of new stores in rural communities, creating thousands of new jobs. Millions of Americans in rural communities will have more choice and competition, where they may have none today. Broadband. 51% of Americans have only one high-speed broadband option – no choice at all! The combined company will create a viable alternative for millions by enabling mobile connections that rival broadband, driving prices lower and improving service. Business and government wireless services. Today, Verizon and AT&T dominate this category with 4x more customers than Sprint and T-Mobile added together. With its assets and capabilities, the new company will unlock real competition for business and government customers. From the first day Sprint and T-Mobile combine and every year thereafter, the new company will employ more people in the U.S. than both companies would separately. More than 200,000 people will work on behalf of the combined company in the U.S. at the start. And, the New T-Mobile plans to invest up to $40 billion in its new network and business in the first three years alone, a massive capital outlay that will fuel job growth at the new company and across related sectors. This is 46% more than T-Mobile and Sprint spent combined in the past three years. This combination will also force AT&T, Charter, Comcast, Verizon, and others to make investments of their own to compete, driving billions more in accelerated investment. Five years ago, T-Mobile merged with MetroPCS to compete in the 4G era – a transaction that has resulted in substantial job growth. Three times the number of people work on MetroPCS today compared to the time of the acquisition in 2013. With that track record, the New T-Mobile will accelerate long-term economic stimulus for the U.S. in the 5G era -- ultimately leading to the creation of thousands of American jobs and supporting business opportunities for the U.S. economy. 5G is expected to create 3 million new U.S. jobs and $500 billion in economic growth by 2024, according to a report from CTIA, and the combined company will be a catalyst in driving that massive economic stimulus. The Boards of Directors of T-Mobile and Sprint have approved the transaction. Deutsche Telekom and SoftBank Group are expected to hold approximately 42% and 27% of diluted economic ownership of the combined company, respectively, with the remaining approximately 31% held by the public. The Board will consist of 14 directors, 9 nominated by Deutsche Telekom and 4 nominated by SoftBank Group, including Masayoshi Son, Chairman and CEO of SoftBank Group, and Marcelo Claure, CEO of Sprint. John Legere, CEO of the New T-Mobile, will also serve as a director. Upon consummation of the transaction, the combined company is expected to trade under the (TMUS) symbol on the NASDAQ. The new company will have some of the most iconic brands in wireless – T-Mobile, Sprint, MetroPCS, Boost Mobile, Virgin Mobile – and will determine brand strategy after the transaction closes. The transaction is subject to customary closing conditions, including regulatory approvals. The transaction is expected to close no later than the first half of 2019. PJT Partners is acting as financial advisor to T-Mobile and rendered a fairness opinion to its Board of Directors. Goldman Sachs is acting as financial advisor to Deutsche Telekom and T-Mobile and rendered a fairness opinion to the T-Mobile Board of Directors. Deutsche Bank also acted as financial advisor to T-Mobile. Wachtell, Lipton, Rosen & Katz is providing legal counsel to T-Mobile and Deutsche Telekom, with Cleary Gottlieb and DLA Piper serving as regulatory counsel. Evercore is acting as financial advisor to a committee of independent directors of T-Mobile and rendered a fairness opinion, and Latham & Watkins is providing legal counsel to the committee of independent directors. Richards, Layton and Finger is serving as Delaware Counsel. Morgan Stanley served as financial advisor to Deutsche Telekom. Barclays, Credit Suisse, Deutsche Bank, Goldman Sachs, Morgan Stanley, and RBC are providing T-Mobile with committed debt financing to support the transaction, and PJT Partners is advising T-Mobile on the debt financing associated with the transaction. The Raine Group LLC is acting as lead financial advisor to Sprint. J.P. Morgan is also acting as a financial advisor to Sprint. Centerview Partners LLC is acting as financial advisor to the Independent Transaction Committee of the Board of Directors of Sprint. The Raine Group LLC, J.P. Morgan and Centerview Partners LLC each rendered fairness opinions to the Board of Directors of Sprint. Morrison & Foerster LLP is lead legal counsel to Sprint and for SoftBank Group. Goodwin Procter LLP is legal counsel to the Independent Transaction Committee of the Board of Directors of Sprint. Skadden, Arps, Slate, Meagher & Flom LLP is regulatory co-counsel and Potter Anderson Corroon LLP is Delaware Counsel. Mizuho Securities Co., Ltd. and SMBC Nikko Securities Inc. are acting as financial advisors to SoftBank Group. T-Mobile and Sprint will host a conference call for investors and media at 12:30 PM Eastern Time today (9:30 AM Pacific Time) to discuss this announcement. A live audio webcast of the call can be accessed at www.Allfor5G.com. To submit questions via Twitter, send a tweet to @JohnLegere, @MarceloClaure, @TMobile, or @Sprint using #5GforAll. Investors and media can access the teleconference by calling 888-599-8685 (U.S. Toll Free) or +1 323-794-2415 (International). The access code for the call is 894223. The conference call will be available for replay and can be accessed from www.Allfor5G.com or by dialing 888-203-1112 (U.S. Toll Free) or +1 719-457-0820 (International). The access code for the replay is 8152135. As America's Un-carrier, T-Mobile US, Inc. (NASDAQ: TMUS) is redefining the way consumers and businesses buy wireless services through leading product and service innovation. Our advanced nationwide 4G LTE network delivers outstanding wireless experiences to 72.6 million customers who are unwilling to compromise on quality and value. Based in Bellevue, Washington, T-Mobile US provides services through its subsidiaries and operates its flagship brands, T-Mobile and MetroPCS. For more information, please visit http://www.t-mobile.com. Sprint (NYSE: S) is a communications services company that creates more and better ways to connect its customers to the things they care about most. Sprint served 54.6 million connections as of Dec. 31, 2017, and is widely recognized for developing, engineering and deploying innovative technologies, including the first wireless 4G service from a national carrier in the United States; leading no-contract brands including Virgin Mobile USA, Boost Mobile, and Assurance Wireless; instant national and international push-to-talk capabilities; and a global Tier 1 Internet backbone. Today, Sprint’s legacy of innovation and service continues with an increased investment to dramatically improve coverage, reliability and speed across its nationwide network and commitment to launching the first 5G mobile network in the U.S. You can learn more and visit Sprint at www.sprint.com or www.facebook.com/sprint and www.twitter.com/sprint. 1 Proforma service revenue and Adjusted EBITDA measures do not include the impacts of ASC606 revenue recognition accounting changes. 2T-Mobile is not able to forecast net income on a forward looking basis without unreasonable efforts due to the high variability and difficulty in predicting certain items that affect GAAP net income including, but not limited to, income tax expense, stock based compensation expense and interest expense. Adjusted EBITDA should not be used to predict net income as the difference between the two measures is variable.